I just received a big box o beer from Stephen the other day as frankly.. he loves to share beer with everyone! Looking through my fridge, I noticed the amount of free space left was minimal.. at best. What better is it to clear out some of my beer space for more beers. Also, I'm no longer unemployed as of today, so having a beer to celebrate the end of 4 years of unemployment needed a very special beer, so a Belgian-style beer (with a cork, no less!) was needed for this special occasion! Paddock Wood released a limited release of Siné Nominé, which is a Belgian-style ale this past spring that has an 8% ABV and comes in a champagne-style 750mL corked bottle, allowing for the beer to be bottle fermented, like Unibroue's beers. Just reading up on this beer, it's brewed in a champagne style. Having tried a few other champagne-styled brewed beers in the past, I generally really liked them, so I'm looking forward to this one as well. Thanks Stephen! Aroma: The first thing I notice about the Siné Nominé is that it has a sweet, citrusy, fruity aroma compareable to a saison, a bit of lemon, and a bit of other various fruits. The Belgian yeast is quite dominant in this beer, giving it a bit of a sting to the nostril, just like a Unibroue beer would. There's a great presence of a chapagne sweetness to it as well. To me, aside from the champagne notes, this beer would be quite a bit compareable to a great Saison ale as the champagne notes just gives it a SLIGHT extra kick. Taste: I've been savouring this for the past hour now and I quite love this. Its a sweet Belgian-style ale that starts off witha medley of fruit and lemon citrus. It has a very slight tingling champagne sensation along the tongue, as well as a BIT of champagne in the beer. The label on the beer lists this as a "light, softly, fruity Belgian style ale made with Clover flower extract", frankly - this isn't as light as the label states, it's quite sweet and not as light as expected.. which I enjoy in some Belgian ales.. but perhaps aging this a bit helped do this beer justice. The Belgian yeast gently hits the tongue and with the mellow, floral hops, leaves a gentle yet slightly stinging aftertaste. I don't really notice much of the clover, but it likely contributes to the hops as it is. Overall Thoughts: Perhaps it's my giddiness from FINALLY GETTING A JOB, but I really enjoy this beer. This beer has a great citrus and fruity sensation compareable to a flavourful saison ale with a great amount of sweet Belgiany yeast and a hint of Champagne to wrap this all up. I hope one day we see Paddock Wood do more beers like this, and.. ship them to Manitoba! I'd surely purchase this. Thanks Stephen for all the treats! 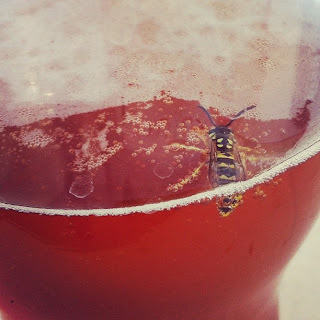 Edit: I wasn't the ONLY one who really enjoyed the beer, I had two wasps surrounding the beer, wanting to go for a sip/swim. One did, the other... not so much. "celebrate the end of 4 years of unemployment"
Do you have an email address that you can be contacted through? If you could afford to drink that much beer while unemployed, I can't imagine how many you're gonna drink now. Looking forward to the reviews. Also, I met another anonymous reader of your blog tonight. Ha. A lot of this is either hoard from a long time ago or friends bring me lots of their beer when in town. Andrea, I tried to send you an email. Also, I noticed I accidentally called you the wrong name in the email, oops! That's what you get for running on no sleep!